The following is a useful article written by a brother some time ago. It is especially relavent now due to the ongoing peace process in order to legitimise the illegal Israeli state. In 1979, the Egyptian regime signed a peace treaty with Israel. In 1993, the Palestine Liberation Organization signed an interim peace treaty with Israel. A year later following these pacts, Jordan’s monarch signed a peace treaty with Israel. A peace treaty between the Syrian, Lebanese, and Israeli regimes is imminent and will be signed some time this year. These are events that carry deep ramifications for the Muslim Ummah. The Muslims need to take a stand against the regimes forging these treaties. This stand must be based on a comprehension of the Hukm Shar’ii (Islamic verdict) regarding peace treaties, especially those signed with Israel. Similarly, our feelings towards these treaties (whether to like or dislike, disapprove or approve) should be established upon this verdict. To derive the ruling of Islam on peace treaties with Israel, an overview of Islam’s System for International Treaties is presented and within that framework the ruling on peace treaties is explained. 1 – The parties to the treaty (two or more states). 3 – The text of the treaty. (e.g., in the treaty of Hudaybiah, the parties to the treaty were the Islamic state and the state of Quraysh; the subject matter was a cease-fire for 10 years etc. ; and the text was ratified by the statement: “This is what Muhammad bin ‘Abdullah agreed upon with Suheil bin Amir… etc.”). Thus, a treaty where the subject matter does not exist at the time of ratifying it is void, e.g. a treaty to regulate commercial travel in space shuttles. 2 – The agreement should be the result of free will, untainted with cheating (e.g., false maps) or duress. The only exception to that is cease-fire agreements which by definition contain an element of duress but are valid nevertheless. 3 – The subject matter of the treaty must be existent and legal. It is Haram to regulate the trade of a Haram matter (e.g. Khamr). In the case at hand, ‘Arafat’s peace treaty with Israel, which includes acceptance of its sovereignty over parts of Palestine is void since its subject matter is Haram. 4 – Other primary conditions of regular contracts such as the existence of a mutual and simultaneous agreement to the treaty. 1 – No treaty can be established with another state which is in a state of war with the Muslims, other than a cease-fire treaty, since a treaty implies the sanctity of life and property of the state’s (the state that the Khilafah is in war with) citizens, a contradiction to the laws of war that would be in effect. However, following the materialization of a cease-fire treaty, other kinds of treaties can be established with that state. Any such treaty is void. Applying that to the peace treaties poses a new problem. When the Islamic State under ‘Umar bin Al Khattab conquered Al Quds it gave a commitment, upon their request, to the original inhabitants to prohibit the Jews from residing in Al Quds. Therefore, any treaty allowing the Jews to reside there (the PLO’s treaty grants them a right to the western part of Al Quds de jure) would be null and void. This does not mean that the state is allowed to engage in maneuvering. The state can maneuver but must not use bogus treaties as a tool in these maneuvers. 4 – The treaty should satisfy a specific objective in the state’s foreign policy. It should advance the goal of Islam’s foreign policy: Carrying the Islamic Da’wah. While this can be a subjective call, the Ummah has the right to take the Khalifah to task in demonstrating how a treaty satisfies this condition. If the treaty is not designed to meet foreign policy goals, the treaty is annulled. The peace treaties do not achieve in any conceivable way these objectives. The objective of attaining the goals of Da’wah is not present in a treaty that protects the borders of Israel, subdues the people in and around Palestine and guarantees the integration of Israel in the region as these treaties stipulate. 5 – The treaty cannot include any illegal terms. Rasoolillah (saaw) says: “The Muslims abide by their conditions except for a condition that makes an illegal issue legal or makes a legal issue illegal.” [reported by Tirmidhi in his Sunan]. Should Muslims accept such a condition under duress, they have to renounce it as soon as they can. Otherwise, the condition is disregarded but the rest of the treaty remains in force. 6 – Treaties should be written in Arabic as it is the state’s medium of expression, instruction, & correspondence. 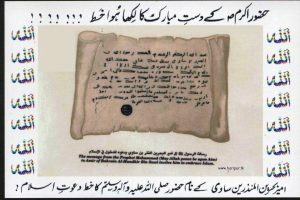 Rasoolillah (saaw) used Arabic in his letters to other heads of states who were not versed in Arabic. The fact that he (saaw) did so, while there was a need to use other languages, proves that the Arabic language is the state’s language and must be used in the conduct of official state business. Violating this condition does not void the treaty, since it has no bearing on the textual substance & objectives of the treaty per se, but it is Haram for those individuals responsible for the violation. This condition can only be waived under imperative situations. In addition, the treaty must have a time limit. Tabari reports the consensus of scholars on this matter in his book “Al Jihad” page 14. Permanent treaties and semi-permanent treaties (treaties for exceedingly long time intervals, e.g. 99 years) are Haram. This was in reference to those Kafireen with whom the Muslims had open-ended treaties. This verse nullifies these kinds of treaties. Furthermore, the lack of a specific time frame for a treaty rules out the conduct of Jihad in the territory covered by this treaty. However, Rasoolillah (saaw) said: “Jihad continues until the Day Of Judgment.” For example, the cease-fire and peace treaties with Israel are illegal since they are not bound by a time limit. Based on this overview, it can be seen that Islam defines an international treaty as a temporary agreement between the Islamic state and other states to regulate a lawful aspect of their relations. The Shari’ah explicates the principles and conditions applicable to this relationship. The Islamic state can freely enter a cease-fire, good neighbor, non-aggression, and neutrality treaties with other states. Rasoolillah (saaw) had a cease fire treaty with the Quraysh state; a good neighbor treaty with the Jewish statelets around Madinah; non-aggression treaties with several entities such as the city-state of Eylah; and a neutrality treaty with Bani Dumerah. The following are some treaties that are Haram and the Muslims cannot be privy to or part of them and should any of they are automatically null and void. 1 – Treaties establishing permanent borders for the Islamic state. These treaties either allow for the existence of more than one Muslim state (if Islam is being applied on both sides of the borders) or arrests Jihad (if Kufr and Islam share these borders). Rasoolillah (saaw) said: “If two Khalifahs are given allegiance then kill the second of them.” [Muslim, section of ‘Imarah].Therefore, the Muslims cannot have more than one ruler and one state. On the other hand, Allah says: “Fight those Kafireen who reside on your borders.” No ideology can recognize borders. An ideology is dynamic in its existence, as opposed to static, & it either expands or shrinks. 3 – Treaties on leasing or giving access to naval ports, air force bases and military roads to Kafir armies. Allah says: “Allah will not grant the Kuffar authority over Muslims.” Such treaties give the Kuffar authority over Muslim lands and a share of authority over Muslims themselves. This is the new face of colonialism. ii) The treaties have a Haram subject (recognizing the usurpation of Muslim lands and accepting the eviction of Muslims from their lands). iii) These treaties are supposed to mark a definitive end to war & they have no time limit. While an open-ended cease-fire is Haram, these treaties amount to more than that, such as their clauses on normalization of relations with Israel. iv) The treaties are an oppressively clear infringement upon the rights and interests of Muslims. They also run against the interests of Islam and the goals of the foreign policy in Islam. v) In particular, ‘Arafat’s treaty contradicts the ‘Umari treaty on Al Quds, a standing treaty which the Muslims must honor & which is currently being trampled on. It is Haram to accept, approve or be pleased with these treaties. The Muslims should present the Islamic point of view in this regard. The Muslim Ummah should follow the events and establish opinions based on the Islamic texts. The African American label may be fitting for immigrant Africans, but not for the so-called Negros. If you read King John and Portugal’s history about the Jews, you will see how all the so-called Negros – actually Jews/Judeans – were moved from Portugal to Ghana, Benin (Kingdom of Judah), St. Thomas before they were enslaved on ships to America and the rest of the 4 corners of the earth.